Survivors of human trafficking are cared for brilliantly by service provider agencies. However, they could still use your help. Hope for Justice is starting an annual Gift Cards Drive to encourage the people to buy gift cards at retailers such as Target, Fred Meyer, Safeway and JC Penney as these can go a long way in providing them everyday necessities. So, this holiday season let us remember human trafficking survivors by making this season more special for them. Please consider donating $20, $50, $100 or more so that survivors can shop for food, clothes and/or toiletries. 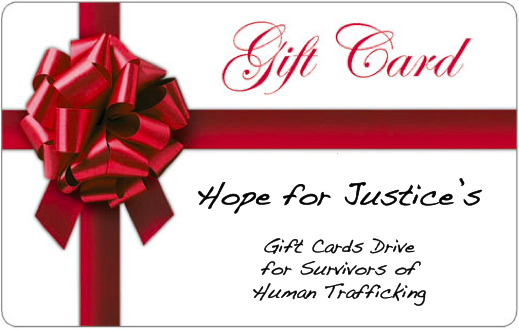 Buy your gift cards and send them to Hope for Justice. We will deliver them to a number of our domestic service provider organizations from Seattle to New York City on December 21st. To read more about this Gift Cards Drive, go here. MALI: Mali extremists abusing rights, targeting children, women: U.N.